I have a question about protection from negative forces. What type of jewelry, preferably a necklace or pendant, would help with that? I read there are certain gems, stones, talismans, etc. that help protect you from negativity. Do you have any suggestions on what I should get and where I could get it from? I am wanting to try something because a lot of negative things seem to happen to me. 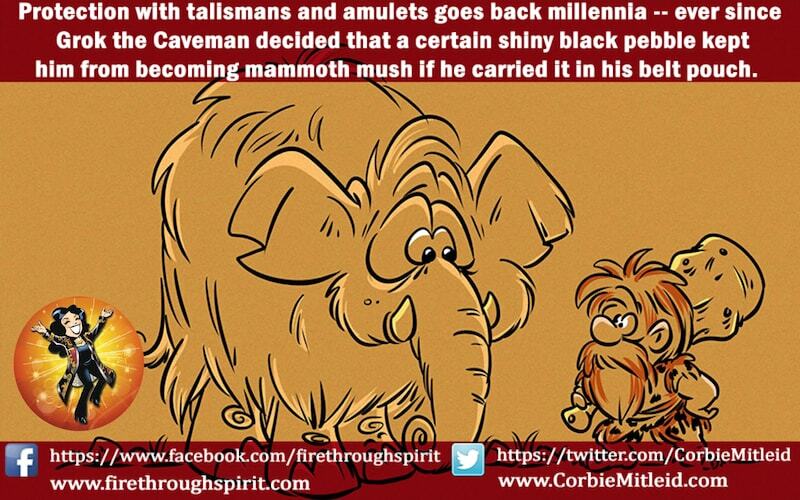 Protection with talismans and amulets goes back millenia, Ross — ever since Grok the Caveman decided that a certain shiny black pebble kept him from becoming mammoth mush if he carried it in his belt pouch. To learn about stones and crystals in general, I highly recommend picking up books by either Melody or Robert Simmons and Natasha Ahsian. All are respected crystal authors whose books will clarify a great deal for you. One of the most reliable stones for protection is black tourmaline, well known for dealing with any negativity. Black tourmaline has a hexagonal crystal, but you will usually find that it has ridges paralleling the octagonal crystalline structure, with striations going up against the edges. It looks almost like rough bark on the outside. It deflects and repels negative energy, especially psychic attack. It protects against microwaves, radiation, “spells” and ill-wishing. It grounds spiritual energy while increasing physical vitality. It defends against debilitating disease and strengthens the immune system. It is also said to treat dyslexia and arthritis. Black tourmaline comes carved, in bead form and in lovely chunks. [x] in” and make that part of your everydau protection, then you are within balance. In my opinion, the most powerful protection stone is jet. Jet is black amber and has been used over the centuries to absorb the negativity thrown at you by others. Energy, when repelled, comes back later and repelling negative energy hits harder the second time around. It is always best to just stop accepting the energy and to discover the spiritual reasons for the negativity. Jet is a great stone to carry and wear to get time away from the stress to look inside and find the root of the issue. Remember, each person holds their own answers to all their questions. Work to find out who can help you unlock the door to your ‘inner world.’ The stones are tools for self discovery and never to be used as crutches to replace the work we need to do on ourselves. Hope this helps. If you (or anyone else) is interested in protective jewelry, Barbie Hathaway can be reached at barbarah@twcny.rr.com.